Mountain Home, AR (January 17, 2019) –- Continuing support of professional bass anglers that dates back to the early 1970’s, Bass Cat Boats will maintain a deep roster of exceptional talent on all three major bass fishing tours in 2019. Whether you enjoy watching someone fish for five big fish over the course of a day or as many scorable bass as they can catch in an abbreviated period, you’ll be able to see them do it in a Bass Cat. Our no compromise, “all of the above” approach to professional bass fishing puts both the fans and the pros in the driver’s seat. 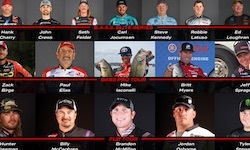 For the 2019 season, Bass Cat will have eleven anglers on the Elite Series, seven on the Bass Pro Tour, and seven with FLW. Expect to see them in the winner’s circle on all three.